Once the cover is in place we slid out the guides and plastic seal protectors and it's time to bolt it on. 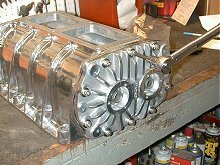 Remember you're working with aluminum, so be carefull not to over-torque these. 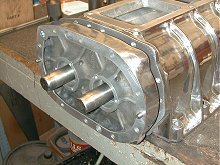 We used stainless bolts for this application since there is no real load on the end plate. Stainless bolts are only about grade 2. 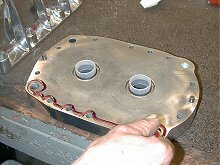 Now we'll turn it around and do the front the same way, applying a line of gasket seal first. Note the seals are already in place in the cover. The front cover is slid on carefully, just as we did the rear cover. 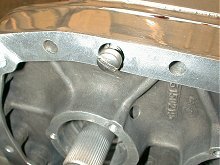 The front cover has two end plate retainer screws that are used for assembly purposes. Don't overlook these. 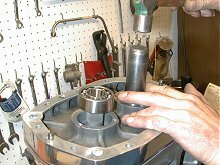 The front bearings are now tapped in place with a hammer and a bearing slide press until they are fully seated. 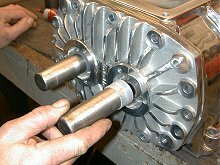 These bearings are a high load, double roller bearing, and are lubed with the front case gear oil.